Just a few days after the majority of have ended their respective EHF EURO 2016 campaigns, they will get to know their opponents on the way to next year's top international event: the Women's World Championship 2017 in Germany. The play-off draw will take place on Saturday 17 December at approximately 14:45 hrs after the official closing press conference pf the Women's EHF EURO 2016 in Gothenburg. 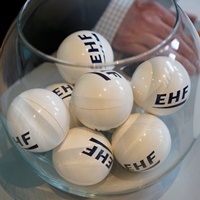 The draw will be streamed live on www.ehf-euro.com as well on the EHF EURO Youtube Channel. While Norway as the defending champions and Germany as the hosts of the World Championship were confirmed with a direct place before the EHF EURO 2016, three more teams – France, Denmark and Netherlands booked a direct place courtesy of their semi-finals participation. The nine best ranked teams of the EHF EURO 2016, who are not qualified directly, will be seeded in Pot 1: Czech Republic, Spain, Hungary, Montenegro, Romania, Russia, Slovenia, Serbia and Sweden. The two bottom ranked teams, Croatia and Poland, will join seven qualifiers from the first qualification phase: Austria, Belarus, Italy, FYR Macedonia, Slovakia, Turkey and Ukraine. Nine times during the draw one team of Pot 1 will be drawn against one team from Pot 2. The first drawn team will have the home advantage in the first leg, which is scheduled for 9 to 11 June. The second leg will follow from 13 to 15 June and the nine winners will qualify for the final tournament in Germany which will take place from 1 to 17 December 2017.